What an awesome/busy Mother's Day weekend! As soon as hubby arrived home from working a nightshift on Saturday morning we woke Miss 5, Mr 3 and our twincesses (18 months) at 6:15am to be up and out the door for the Color Me Rad 5k which we were all super excited to review. We met up with my sister, drove to Wet N Wild and scored a perfect car park right near the start and finish line. After collecting our colour packs and wrist bands, we suited up so we looked the part with our white Color Me Rad 5k t-shirts and fluro sunglasses. We lined up at the starting line to join in with the 8am group where we were doused in pink corn starch and embarked on our 5km walk/run. The track took us around the outside of Wet N Wild, THROUGH Wet N Wild where we high-fived with the life guards who were already on duty protecting the water areas before the park's official opening time. After walking through the park, and out the other side, we were out in the countryside. It felt like we were a million miles away from the sea, sun and sand that the Gold Coast is famous for. We could see mountains and paddocks of beautiful green grass, hear the birds singing and enjoyed looking at the horses used in the popular Outback Spectacular Show. We even saw a donkey! Along the way, there were different colour check points where we would run through with the kids and have a laugh as we were covered in colour. We would put the rain cover over the pram and hubby, my sister and I would take it in turns walking around the check point to protect our favourite Out N About twin pram and of course our twincesses from being colour-bombed. The lovely walk took us out to the Paradise Country farm areas where tourists visit to get in touch with all things Australiana (and somewhere I'm definitely keen to return to with the kids now that I know it's there!). We took photos with a Ned Kelly statue and made our way back along the road where other Color Me Rad 5k participants slapped high-fives with Miss 5. 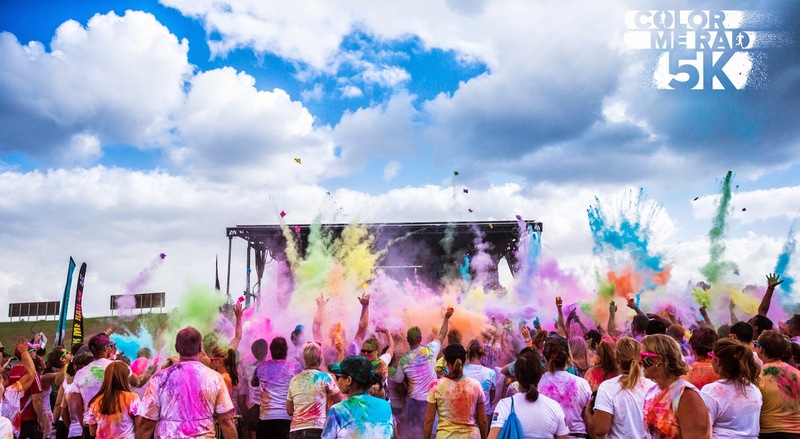 There was an awesome buzz in the air as everyone was there - early on a Saturday morning - to have fun, enjoy the walk/run and get covered in colour! After making it to the finish line, we collected our colour packs and enjoyed the festivities near the stage where everyone was dancing along to the fab tunes (hello Spice Girls!!). Mr 3 and Miss 5 enjoyed covering themselves, each other and hubby, my sister, and I in colour. And the twins munched on some morning tea in the pram. The Color Me Rad 5k Gold Coast (Saturday May 9, 2015) was an enjoyable event at a perfect location. Perfect parking, not too far to travel, great facilities and well organised. We hope to see even more friends joining us next time!